This guest post is co-authored by Sarang Shidore, a visiting scholar at the LBJ School at the University of Texas at Austin, and Joshua Busby, associate professor of public affairs at the Robert S. Strauss Center for International Security and Law at the LBJ School at the University of Texas at Austin. For four years, we have been tracking the solar sector in India as it seeks to scale up to meet the government’s 100GW target by 2022. Although rooftop additions continue apace, there has been slower growth at the utility scale. The next stage of growth in India will be difficult to achieve without major reform across the electricity sector as a whole. But an upcoming national election in May could bring in a weaker coalition government, adding to the sector’s already large challenges that include land acquisition and problems with the existing auction system. India’s annualized solar capacity addition was 8.2 GW in 2018, down from the previous year’s all-time high of 9.6 GW. Though utility-scale additions dropped by nearly 20%, rooftop solar showed a remarkable surge of more than 70% over the previous year from a smaller base. However, India’s rooftop growth is focused mainly in the commercial & industrial sectors – residential solar has yet to take off in the country. As of January 2018, India had more than 26 GW of capacity of solar electricity, dramatically higher than the 2.5GW in 2014 when Prime Minister Modi took office. However, as we wrote last year, 100GW is a stretch goal that India likely won’t reach by 2022, and that continues to be the consensus among industry-watchers. The latest forecasts estimate that India will reach 65GW of installed solar capacity by 2022, of which 51GW will be utility scale and the remainder divided between rooftop, open access, and off-grid solar. While that is below the announced target, it is still impressive, especially where such progress was thought unlikely just a few years ago. Given a backlog of approved projects, there will likely be more capacity installed in 2019 than 2018. However, a number of developments have undermined developers’ confidence. Reverse auctions, in which prices are continuously bid down until prices fall no further, have driven solar prices down in India to less than 3 rupees (4.3 cents) per kilowatt hour. A new import tariff as high as 25% kicked in this year, aimed at solar panel imports from China and Malaysia. China accounts for 90% of panel installations in India, so this, along with a depreciating rupee, has raised costs across the board and lowered the returns that developers and investors can earn. 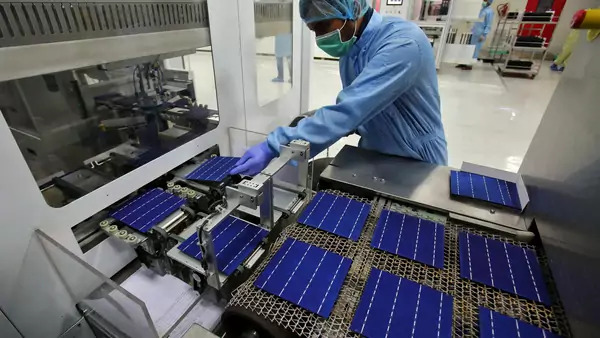 The increasingly challenging economics of large-scale Indian solar development has forced consolidation in the market. In 2019, just 4 players Azure, Acme, NLC, and Japan’s SoftBank are expected to provide more than 40% of new utility-scale capacity. Increasingly, there are instances of auctions being run and then canceled after the market-discovered auction price was deemed too high, making the business of bidding for projects more risky for developers. This has happened both at the state and central level and is damaging the investment environment for solar. Despite these hurdles, significant interest remains from foreign investors from Japan, the Persian Gulf, and Europe. American investors who are earning better returns at home have largely steered clear of the Indian market. Land acquisition issues continue to dog plans for some large-scale solar parks. More than 40 such parks are in various stages of planning and development. Though land forms less than 5% of typical project costs, it is often the most complex and time-consuming step. For instance, a 500 MW park in the large state of Maharashtra was scaled back this year after a farmer protesting inadequate compensation committed suicide. A large 2 GW solar park, located in the desert state of Rajasthan, is expanding more slowly than planned due to land disputes. Also, developers often opt for acquiring fertile land rather than wasteland, as it is typically closer to existing grid infrastructure. This further increases the chances of farmer resistance. An ambitious “green corridor” project to strengthen the grid between states with large generation potential and centers of high electricity demand is ongoing, and allocations for it increased by nearly 20% this past year to $92 million. Yet, as new renewable energy gets added to the grid, the demand for greater inter-state capacity is also growing. The green corridor is effectively a moving target and is currently lagging well behind additions of new capacity. India’s electricity sector, mostly organized at the state level in India, has undergone major reforms since the 1990s. From being integrated and almost entirely government-owned in each state, the sector was “unbundled” or split up with different companies handling generation, transmission, and distribution. Along with unbundling, privatization was also pushed. However, while generation was substantially privatized, transmission and distribution remain predominantly state-owned. However, electricity subsidies for agricultural use among India’s vast farming population have also increased steadily. What that means is that distribution companies (Discoms) in most large states face significant under-recovery of costs and are saddled with huge debts. This acts as a major constraint on the expansion of solar power, as Discoms are highly reluctant to buy more electricity from renewables in the face of existing long-term contracts with coal plants. The central government launched a key initiative in 2015 to rescue Discoms from their financial distress, called UDAY. However, UDAY is largely a failure. Though stricken Discoms have temporarily regained much of their health by transferring 75% of their existing debt to state governments, the Discoms have not implemented other reforms like reducing grid losses to improve their long-run profitability. The distribution companies’ generally poor financial health thus constitutes a major barrier for renewables penetration going forward. Moreover, there are challenges and costs of grid integration associated with renewable power because of intermittency, the fact that the sun doesn’t always shine and the wind doesn’t always blow. In the absence of affordable energy storage, grid managers have to ramp up other sources of electricity to act as balancers when there is no sun or wind. Hydropower and natural gas are ideal balancing sources for variable renewable electricity. Some states such as Karnataka do have sufficient hydropower to balance their renewables generation. But, many others do not, and, in the absence of viable natural gas plants, coal plants have to play this role. However, ramping coal plants up and down is expensive. As renewables penetration increases in the Indian electricity system, these challenges will get more serious. New Solar Models – Seeds of Change? New innovative approaches suggest a different path forward. While they tend to be smaller scale, they meet the electricity needs of key constituencies and can help overcome problems of land acquisition and below-cost electricity for agricultural users. Madhya Pradesh, a poorer state in the central part of the country, is pursuing demand aggregation to reduce rooftop solar costs and is rolling out solar pumps for farmers. The rooftop program is initially oriented towards public buildings, such as government departments, schools, universities, and hospitals. The unique aspect has been to aggregate demand for would-be developers by bundling sites together Before the bidding process, the state surveyed the sites to estimate their technical requirements and made that information available to developers. This has led to electricity price bids of less than 2 rupees per kilowatt hour in some cases, which is as much as 5 rupees cheaper than standard Discom rates. While significant subsidies of more than 40% helped facilitate lower bids, state officials argue their preparatory work and transparency of information brought costs down even further by reducing investors’ uncertainty. The agricultural sector is responsible for more than 30% of electricity demand in a number of states as many farmers rely on groundwater for irrigation. Because farmers tend to get subsidized power, many of India’s Discoms perennially lose money. However, farmers also get unreliable power for limited hours, often at night rather than during the day. The wealthier state of Maharashtra, which includes the India’s financial capital Mumbai but is also heavily agricultural, is experimenting with solar agricultural schemes to offer farmers more convenient and reliable daytime power and should help Discoms improve their balance sheets. Maharashtra has developed a solar feeder scheme which sets up a small scale solar plant of 1-10MW in the community. Farmers connect to this power plant to run their pumps. The southern state of Karnataka, which includes the national IT hub Bangalore, has innovated a semi-distributed solar model by building smaller scale parks of 10 MW to 100 MW at the taluk level (taluks are clusters of villages). Taluk-level solar plants do not require large parcels of land and can be located more closely to the rural consumers. The model could ease the land challenge, lower grid losses, and reduce Discoms’ financial losses. Karnataka also innovated a land leasing model for its large 2 GW Pavagada solar park located in a poor drought-stricken region. Instead of acquiring farmer-held land outright, it offered 28-year leasing deals. 13,000 acres were acquired this way, with thousands of farmers signing lease contracts. In exchange, farmers are paid an annual rent with a periodic escalation clause. This eased farmer concerns over permanently losing their land and assured them a steady income regardless of the weather. Pavagada helped Karnataka become the leader of all Indian states in net solar capacity. From a climate change and air quality perspective, the more important question is whether India’s renewables growth will displace coal as soon as is practically feasible. From that point of view, the growth of the last few years of the solar sector looks less impressive. However, from an energy security perspective (the primary driver of India’s energy policy), solar has provided a welcome, cleaner domestic source of electricity and has significantly alleviated power deficits triggered by uneven supplies of domestic coal in states such as Karnataka. Coal still retains its preeminence in India’s electricity mix, responsible for close to 75% of electricity generation. Even as some old coal burning power plants are being taken off-line, some new coal plants are being built. In recent years, renewables additions have outpaced coal; for example in 2018, renewables additions were 11.2 GW (of which solar was 8.2 GW) compared to coal additions of 4.5 GW. Though the new coal plants are more efficient supercritical and ultrasupercritical plants with greenhouse gas emissions reductions of more than 25%, they are still net carbon additive. In 2018, the Council on Energy, Environment, and Water (CEEW), a prominent Indian think tank, developed scenarios of low carbon development for India. In the most pessimistic scenario where renewables projects have to bear the cost of integrating their power into the grid, the non-fossil share of electricity will rise to at least 48% in 2030, up from around 20% today. In the most optimistic scenario in which renewables do not have to bear any cost of grid integration and coal plants operate under a new market design, the share will be as much as 79%. This is a large spread of possible scenarios, and speaks to the high sensitivity of sector pathways to policy and regulatory initiatives. In other words, much can be done to bend the curve. In spite of sector headwinds, more than 13 GW of solar will be added this year according to Bridge to India, of which 10.9 GW will be utility scale and 2.4 GW rooftop. This surge is largely due to legacy effects of intense tendering activity in late 2017 and early 2018 coming online in 2019. But the overall trends of 2018 point to serious risks of a solar slowdown. If renewables are going to displace a larger share of coal in the medium-run, then some more transformational changes in how the electricity space is regulated and organized will have to be pursued. As we argue in an article forthcoming in Energy Policy, the significant growth of renewable energy in India since 2014 has very much been a top-down affair greatly driven by policy innovation and high prioritization by the central government and some key states. This policy push was driven by multiple factors including global pressures leading up to the Paris agreement, the leadership of Prime Minister Modi, and energy security and investment factors. However, the upcoming national election will likely return a more fractious coalition government, reducing the appetite for ambitious energy sector reform, all in the context of flagging global climate action. The question of electricity reform in India highlights the challenges for democracies of reconciling diverse interests and voter groups with the need to move to cleaner sources of energy. This challenge is not unique to India. Witness the prolonged discussions in Germany over the timing and terms of phasing out coal production. The United States, with the deregulatory pushback in the Trump era, is also facing similar challenges. Solving this puzzle will be a key challenge of national and global governance in the years ahead. The authors would like to acknowledge the support of the IC² Institute, the LBJ School, and the Strauss and Clements Centers at the University of Texas.